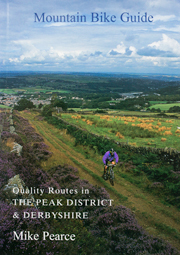 The Mountain Bike Guide - online shop selling maps and cycling guides for The Peak District and Derbyshire. The maps you will need to cover the rides in my book are available online from Amazon.co.uk. To purchase any item shown below just click on the picture or the 'Buy from Amazon' link. This will open a new window showing that item on Amazon's web site. This map covers most of the routes in the southern part of the area. This and Dark Peak are the two most important maps if you want to enjoy the full range of rides described in the book. This map covers most of the routes in the northern part of the area. This and White Peak are the two most important maps if you want to enjoy the full range of rides described in the book. This covers the area just to the South of the White Peak map and is needed for the Belper ride. This covers the area south and west of Derby and is needed for the Netherseal - 4 Counties ride.